So A Plank Is A...What? There's two different kinds of planks in my world and neither of them have anything to do with lumberjacks, crosscut saws or labour disputes. This website will focus mostly on the fun side of planking - plank photos, but there serious part of planking is the exercise. I've decided to let the wizards at Wikipedia explain this one: Planking (or the Lying Down Game) is an activity consisting of lying face down - sometimes in an unusual or incongruous location. Both hands must touch the sides of the body. Some players compete to find the most unusual and original location in which to play. The term planking refers to mimicking a wooden plank. Planking can include lying flat on a flat surface, or holding the body flat while it's supported in only some regions, with other parts of the body suspended. Many participants in planking have photographed the activity in unusual locations and have shared such pictures through social media. This is a typical plank pose for a photo. It's not me, but a photo pulled from the website www.awkwardfamilyphotos.com. Pretty brave to do this at Niagara Falls. 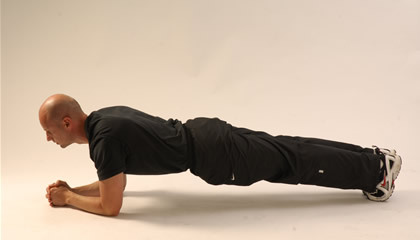 The plank (also called a front hold, hover, or abdominal bridge) is an isometric core strength exercise that involves maintaining a difficult position for extended periods of time. The most common plank is the front plank which is held in a push up position with the body's weight borne on forearms, elbows, and toes. Many variations exist such as the side plank and the reverse plank. The plank is commonly practiced in pilates and yoga, and by those training for boxing and other sports. Wisely the Wiki people note that the plank (fad) should not be confused with the plank (exercise). All clear? If you still don't get it, keep looking around this website for help. If that doesn't do it then just search online for information.